The biggest problem with Batman is that it’s Batman. I’m starting to think that the more high-profile the source material, the worse the Telltale adaptation. It’s not a hard and fast rule, I guess. The Walking Dead gets a pass because it was the first of the modern-era Telltale games, and people love Tales From the Borderlands. 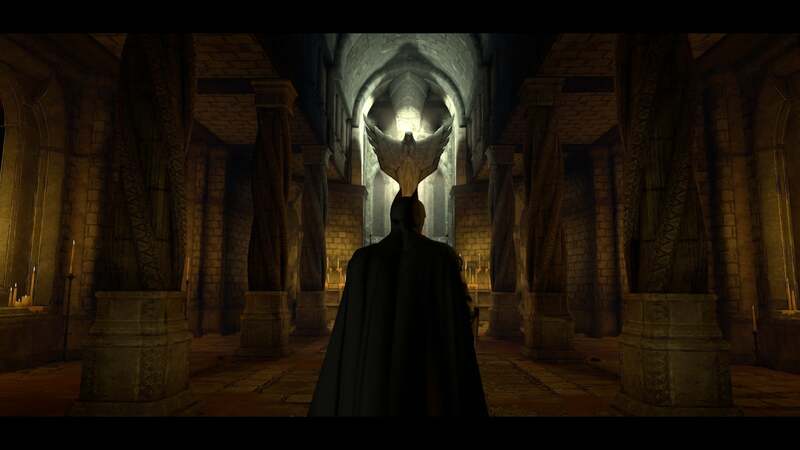 But Game of Thrones was the first Telltale game to really underwhelm, and with Batman’s fifth and final episode now released I think it’s safe to say it’s also somewhat disappointing—and for similar reasons. The problem seems to be Telltale trying to construct a Telltale-style story within the bounds of a very strict universe. The studio’s best games, be it Borderlands or Wolf Among Us or even The Walking Dead, have taken place in well-established worlds but ones where there’s plenty of freedom for characters to act. Game of Thrones and Batman don’t meet those criteria—these are clearly-defined characters, with well-entrenched patterns of behavior the story needs to account for. And it doesn’t quite work. 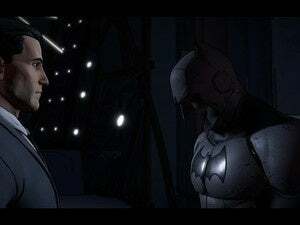 The best thing Telltale’s Batman does is sideline Batman. I said it first in our preview coverage, then in my impressions after Episode One, but it holds just as true here at the end. 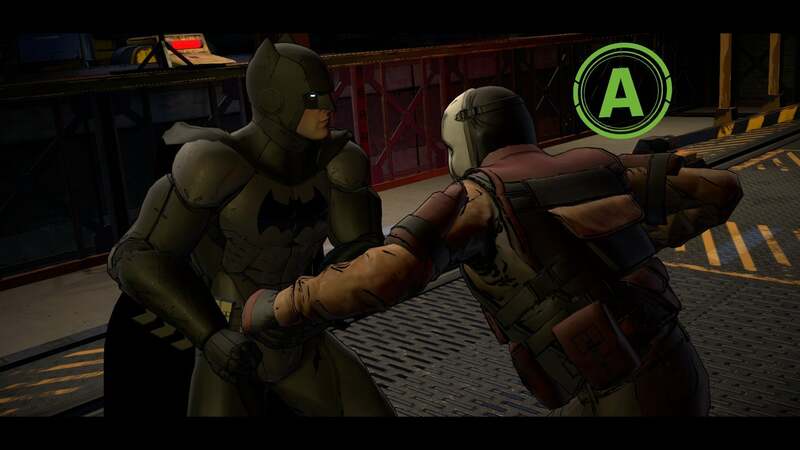 Nine times out of ten Batman’s solution to a problem is to punch things, and action has never been Telltale’s strong suit. Even here, where the action sequences are the best they’ve ever been, it still amounts to pressing the right button at the right time to make Batman do Batman stuff. All I really want to do is watch the scene playing out on screen, but instead I’m stuck trying to figure out when it’s going to make me press the A button or whatever. It’s dull. And so Batman’s best moments come from the man beneath the mask, Bruce Wayne. These segments play to Telltale’s talents, with Wayne talking his way through everything from fancy political fundraisers to press conferences and corporate maneuvering to fireside chats with Alfred. 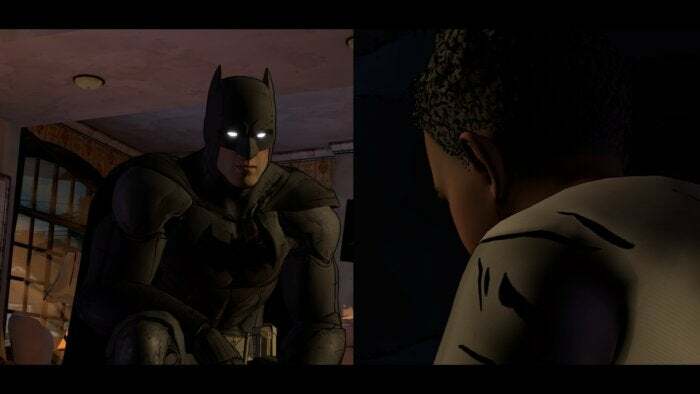 Telltale also does an excellent job building scenes around dramatic irony as characters often comment on Batman to Wayne directly. How you handle those moments can be pretty interesting, whether Bruce Wayne talks trash about his alter-ego to try and alleviate suspicions, or whether he calls the Caped Crusader a hero to try and save Batman’s public image. It humanizes a character who’s often reduced to (at least in films and games) the side-story, the forced dramatic pause between action scenes. 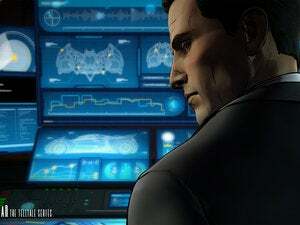 Compare, for instance, how much screen time Bruce Wayne gets in Christopher Nolan’s trilogy versus Telltale’s story. There’s no contest. Wayne isn’t the only one who gets explored on a deeper level. The few “Oh wow” moments packed into Batman are almost all character-driven, be it a role reversal or an alignment change or even just the central rapport between Catwoman and Batman—or rather, between Selina Kyle and Bruce Wayne. 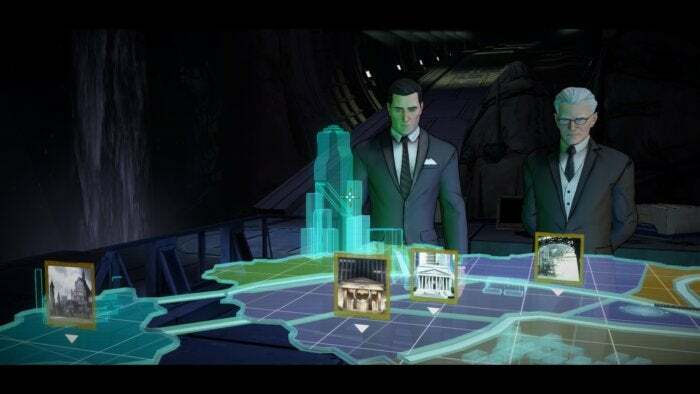 Many of the game’s finest interactions involve her and Wayne exploring their relationship to each other and to Gotham, fundamentally enemies and yet drawn together. It’s nothing that hasn’t been done in the comics, but with five episodes for it to breathe the discussion becomes a thematic focal point. But like Game of Thrones, the biggest problem with Batman is that it’s Batman. There’s been a lot of writing in the past few years about “the illusion of choice.” Telltale’s games act like the player has agency, like the player’s choices matter, but in the end there’s a central story being told. Picture Telltale’s stories as a diamond, or as two parallel paths—sometimes diverging, sometimes converging, but always heading towards a single end. Telltale’s best games disguise this fact though. In The Wolf Among Us, for instance, there are multiple points in that story where the player might ask “If I’d chosen the other path earlier, would things have gone differently?” And the answer is almost certainly “No,” but the player doesn’t necessarily know that, and thus the illusion survives. For example: Two Face. Everyone knows Harvey Dent. Everyone knows Two Face. Two Face was clearly being set up to be an important part of this game from Episode One, when you’re campaigning for Harvey Dent. But a choice early on allows you to save Harvey from being burned into his iconic Two Face visage. Neat, right? Well, no. He still becomes Two Face, except without the burned face. At that point, it doesn’t even feel like a choice. Even a non-choice wouldn’t be the end of the world though, except Batman’s writing gets pretty sloppy between acts. Catwoman becomes Schrodinger’s Catwoman, randomly cropping back up late in the story even after she told you she left the city, for seemingly no reason. Worse is a point late in Act Four where you’re given the choice between two locations. You can either go stop someone from messing with Batman’s tech, or go to Wayne Manor to stop a different threat. I chose to go to save my tech, that seeming like the more pressing issue—and when Act Four ended, it ended on a teaser of Wayne Manor on fire, burning to the ground. Yet when I finally made it back to Wayne Manor in Act Five, I found home sweet home lightly-toasted at best, almost wholly intact except for some scorch marks on the carpet. Worse still, when the scene moved on to the next day’s events, Bruce Wayne walked around the manor and it looked completely spotless, as if it hadn’t been engulfed in flames the night prior. This sort of thing shatters the whole illusion Telltale works so hard to build. Immediately you go “Well, I guess that choice didn’t matter at all,” and it undermines the story. In something like The Wolf Among Us, it feels like the player is an active part of the storytelling process. 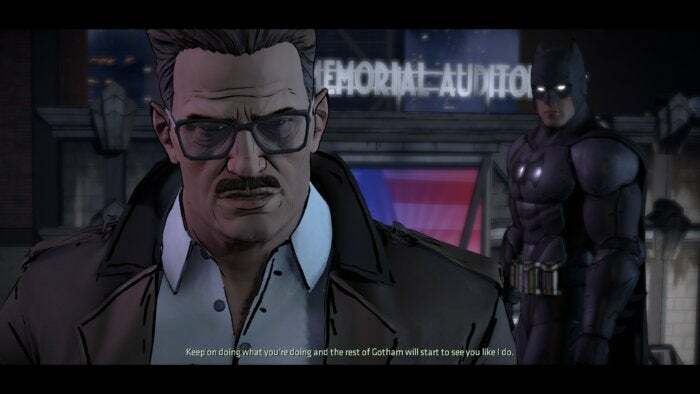 With Batman, it feels more like you’re watching a semi-interactive movie where most aspects are already preordained, the curtain too thin to hide Telltale’s writing wizard’s from view. But the worst aspect of all is Telltale’s engine, and I think we really need to talk about it here, albeit briefly. It’s busted. Just completely busted. It’s somewhat funny only because Telltale said that Batman was going to be the big engine overhaul, that it was going to fix all the problems that’ve plagued Telltale’s games since the first Walking Dead season. It made the problems worse. Performance on my GeForce GTX 980 Ti is abysmal, even after December’s performance patch. The game hesitates at the start of every single scene and sometimes never recovers, stuttering along in some sequences at 30-40 frames per second. Dialogue gets desynced from audio on a regular basis, and characters or scenery sometimes don’t render fully. When I switched to a GTX 970 performance was even worse, with the game barely wanting to run at all in certain scenes. I just don’t quite understand it. I know that Telltale’s games are somewhat complex, with the game having to load up different lines of dialogue and what-have-you based on your past choices. But still, performance is terrible here, worse even than I remember from previous Telltale games. It’s a blemish on Batman, and something that desperately needs fixing. Mostly I just lament that we’ve lost 2013-era Telltale. It hasn’t been that long, but the studio’s meteoric rise has seen them ditch The Wolf Among Us and properties of that caliber in favor of huge blockbusters like Batman and the newly-announced Guardians of the Galaxy. And I get it. There’s money to be made. Smaller titles played to Telltale’s strength though, I think. There was a freedom that came from their niche appeal. When you’re handling something as beloved as Batman or Game of Thrones, you just can’t take the same chances, and Telltale’s structure doesn’t work so well when it’s chained to an 800-pound anvil made up of fan expectations, as much as the writers try. Like Game of Thrones, Telltale's Batman tries to escape the constraints of its well-established universe but ends up falling into the same patterns and railroading the player through a story devoid of real heart.